What I’ve been reading . . . Almost exactly a year ago, in an interview with Jason Sizemore, I politely asked him how Apex Magazine was born. He must have realized what I was really asking was “were you absolutely crazy?”, because he answered tersely and politely. We both knew there was a lot more to that story. For Exposure is the rest of the story. We all know I don’t read much non-fiction, which is it’s own tragedy. So, a chance to read non-fiction, and learn about the dark underbelly and weird secrets behind the birth of Apex Publications? Sign me up! Full Disclosure: I am a contributor at Apex Magazine, and Jason is a personal friend of mine. What does that mean for you? Not much, except that I’ve met most of people mentioned in For Exposure, yet I still missed half the jokes. For Exposure starts with Jason’s childhood – his religious upbringing, watching horror movies with his mom, and falling in love with reading science fiction, horror, and fantasy. That little boy grew up, got a job in IT, had the worst 30th birthday ever, and decided there had to be something better than this. He dreamed big, and Apex Science Fiction and Horror Digest was born. Shortly after that, Jason attended his first fandom convention with the goal of putting a promotional copy of Apex Digest into the hands of anyone at the con who would stand still long enough to talk to him. Didn’t he realize that con-goers love a)free stuff and b)con virgins? Also? Strange glitter covered ladies found in elevators should always be trusted and mysterious alcoholic drinks shouldn’t ever be trusted. If you’re a con-goer yourself, you’ll get a chuckle out of these chapters. If you’re not a con-goer your mileage may vary. For Exposure is full of the ups and downs of Apex, how it phoenixed through awful contracts, doomed distribution models, badly timed illnesses, the joy of socializing with amazing people at conventions, finding the right people for your team, and watching your risky decisions pay off. Apex Magazine has been nominated for a Best Semi-Prozine Hugo three times, and novels, short stories, poetry and artwork published through Apex have won the Nebula, Aurealis, Rhysling, Stoker, and Chelsea. So you tell me if you think the risks Jason took have paid off. For Exposure isn’t just 200 pages of Jason listing his risks and accomplishments. It’s funny and awkward convention stories, strangers with weird advice, learning the hard way that there are convention room parties and then there are convention room parties, and that being shy and socially awkard can actually get you *more* attention. If you’re familiar with Apex Magazine or any of the novels or anthologies published through Apex Publications (or even better, if you’ve met any of the authors or editors mentioned), you’ll get more out of For Exposure, but even if you haven’t, it’s a fun look behind the curtain of what happens when you dream big in small press publishing. There’s also more than just Jason in this book. He invites his friends and confidants to write “rebuttal” essays, basically the “what really happened” (for their own exposure, of course!). You know, what really happened in that nightclub party, how he really got home after being medicated with morphine in a vacant hospital, and what the slide-show in that room party was really showing while Britney Spears music was playing. These rebuttal essays come from folks like Justin Stewart, Maurice Broaddus, Goeffrey Girard, Janet Harriett, Lesley Conner and others. My favorite rebuttal essay is Geoffrey Girard’s because I can attest to that man’s unreal mane of hair, and his lunacy filled essay is exactly what you’d expect from a Writers of the Future award winner. I nearly fell off my chair when I read Lesley Conner’s essay, because she namechecked me. The opening chapters of For Exposure dragged a bit for me, with more detail than I needed regarding advice received in public restrooms, and the debacle of the broken fax machine. That said, the pace picks up, more interesting details get more attention, and contributors even get a chance to predict where they think Apex Publications will be in ten years. 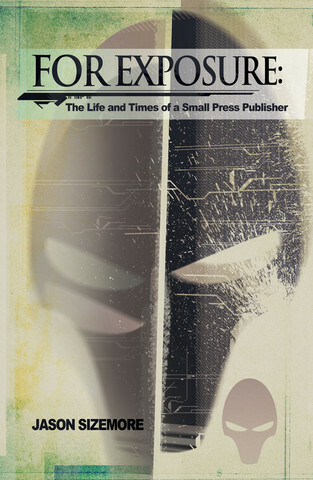 All in all, For Exposure is an entertaining behind the scenes look at small press publishers and what their creators have gone through to put those coveted magazine issues and books into your hands. Actually, I wish more small press folks would do “behind the scenes” books like these (I’m looking at you Neil Clarke and Mike Allen!). 3 Responses to "For Exposure, by Jason Sizemore"
I just got a digital review copy of this, and not only that but I’ve ordered a signed copy (which should be coming soon?) I love Apex and I’ve had the pleasure of interviewing Jason, Lesley and Geoffrey on my blog, so I’m super excited to read this!